I graduated from The University of Texas at Austin with a degree in Government. I also minored in Accounting, Economics, Spanish, and Latin American studies. I have over five years experience as a Financial Accounting tutor. I began tutoring at Texas State University in San Marcos and have also worked at The University of Texas at San Antonio as a financial accounting tutor. I am currently working on a Masters of Business Administration at UTSA. I understand the difficulties some students have with the concepts in financial accounting, so I explain the material in more than one way. I also have over 5 years experience teaching English as a Second Language. I obtained my TESL certification in 2013 during my last semester at UT Austin. Once I graduated, I moved to Queretaro, Mexico to teach English as a Foreign Language for 6 months. I have also taught at the Universidad Autonoma de Benito Juarez in Oaxaca, Mexico. I earned a Graduate certificate in Teaching English as a Second Language in December 2018. I specialize in teaching English to Spanish speakers. As a student of Spanish. I understand how difficult and intimidating learning a new language can be, which is why I believe patience is an essential trait for an ESL teacher. I also create lessons to meet the needs and goals of each individual student. Financial accounting was one of my favorite classes as an undergraduate at The University of Texas at Austin. Not only did I learn the material from my professors, but I also learned how to be an excellent teacher from them. Knowledge of financial accounting concepts is essential, but understanding the frustration students are going through is also key to being an excellent teacher. My knowledge of the material and the patience and understanding I bring to each session are what make me an outstanding teacher. 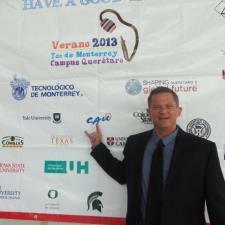 I discovered a talent for teaching English as a second language while attending Tec de Monterrey in Queretaro, Mexico. Once I discovered this talent, I earned my certification and moved back to Queretaro to teach English for six months. Through this experience, I developed my skills as an English as a second language teacher. As a graduate student in the Teaching English as a Second Language at UTSA, I have learned that being a fluent English speaker was only the foundation. I have learned to tailor lesson plans to meet the needs of all of my students. I also realize that each student has a different manner of learning, which requires the teacher to approach students as individuals. Feel free to contact me with any questions you may have regarding my teaching philosophy or to schedule a lesson. Once we meet I am always open to suggestions. My primary goal is for my students to get the most out of our time together. Communication is the key. I was an Accounting minor at The University of Texas at Austin. I was a Financial Accounting tutor Texas State University - San Marcos (2013 to 2014) and The University of Texas at San Antonio (2016 to present). I earned a certificate from The International TEFL Academy in 2013 while attending The University of Texas at Austin. I will finish the graduate certificate program for teaching English as a second language at The University of Texas at San Antonio in the Fall. Before beginning that program I taught in Queretaro, Mexico. I also taught in Oaxaca, Mexico last summer at the Universidad Autonoma Benito Juarez de Oaxaca. I had my first accounting tutoring appointment with Alan today. In fact, this is the first class I've ever been tutored in and I'm nearly half-way through grad school. I was in such a panic and felt overwhelmed by the subject matter that, after so many years of education, I had to reach out and find help. Alan was wonderful! He was very patient with me, knew his stuff and really put me at ease. I'll be turning to Alan for more assistance and would highly recommend him to anyone else needing some help.